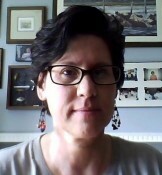 Jennifer Porter’s story “The New Wife” appeared in Issue 5, published in January 2014. What was the inspiration behind “The New Wife”? Well, I am trying to stay married to the same person I’ve been married to for 28 years now, so I will keep that inspiration my little secret. How do you write? With a pen? A keyboard? I write with a keyboard but I work stories out with a gel pen and a journal, including writing down the original image, thought, or character that inspires me and working through revisions. What is your writing process? How many drafts do you go through? I liken my writing process to a self-inflicted Medieval torture chamber. I start every day of writing by reading through and editing everything written thus far on that piece and I cannot move forward in the draft until it feels right enough to do so. Then I draft away until my mind poops out or I just can’t figure out what happens next. Then I do this all over again the next day, knowing that I will probably throw out many of the pages I tortured myself over. I think I am a very slow writer, going through many drafts and thinking and thinking about my stories all the while. My stories often wake me up in the night even though I tell them not to do that. Where did you publish your first piece? The Apeiron Review published my first literary piece! I was so crazy happy when I got the acceptance email I spent two days telling anyone who would listen – all four of them. Before this, I had a few pieces of children’s lit published. What writers have influenced you the most and why? My teachers at the Bennington Writing Seminars. Rachel Pastan taught me how stories are structured. Askold Melnyczuk taught me that stories are created word by word. Alice Mattison taught me that it isn’t what story I tell, but how I tell it. Jill McCorkle taught me to find what a story is really about it and then re-write it from that knowledge. I feel very lucky to have worked with the faculty I worked with at Bennington. Flannery O’Connor, Virginia Woolf, and Alice Munro. The Writer’s Chronicle by AWP always has excellent articles. I search for places to submit using NewPages and I do a lot of research, ordering strange and unknown books through my local library. Shout out to your favorite small presses and magazines—excluding us, of course. I have to give a shout out to Riding Light Review. They were kind enough to take me on as an associate editor. The inaugural issue is set for August 2014. Check it out at www.ridinglightreview.com. I also have friends working hard on the following: Language for a New Century, drafthorse lit journal, Free State Review, and Four Chambers. Do you have any upcoming work that we should keep an eye out for? My story “The Green Frog Publishing Company” is set to appear in the Spring Issue of the Jet Fuel Review. And while this story is humorous and fictional, it was inspired by actual events from which I have only just slowly recovered. What question would you have liked us to have asked?